Are you aware of the potential serious short and long-term adverse side effects of tranquillizers and sleeping pills including cognitive impairment or brain damage which can be permanent, cross addictions to other drugs, paradoxical reactions, psycho-motor effects, creation of anxiety, depression, overdoses, suicidal ideation, emotional blunting, addiction and withdrawal etc.? Are you aware that tolerance and addiction to tranquillizers and sleeping pills can occur within weeks of regular use and that you can experience debilitating withdrawal symptoms upon discontinuation and between pills? That higher dosages are needed over time to achieve the same initial effect? Do you know what the withdrawal symptoms from these drugs include? Do you know who to go to for medical/professional help in withdrawing from these drugs? Do you drive a car or have you had accidents under the influence of these drugs? Are you aware that tranquillizers and sleeping pills can cause drug induced anxiety, depression, mood disorders and other "alleged psychiatric disorders" which often disappear when the drugs are discontinued? Are you a senior on long term use of tranquillizers and sleeping pills experiencing falls, problems with concentration, anxiety, depression, insomnia? Are you pregnant and being prescribed tranquillizers and sleeping pills? Do you know about "floppy baby syndrome" and its similarity to "fetal alcohol syndrome"? Are you one of the 20% of the world's adult population (30% of seniors) who have been prescribed tranquillizers and sleeping pills longer that 2 - 4 weeks or for intermittent use, contrary to guidelines established 20 years ago? Are you aware of the high socio-economic and health costs associated with the continued misprescribing and uninformed use of these drugs including career devastation, family dysfunction, violence, deaths from overdoses, lost years, disability and life insurance claims, emergency hospital admissions etc.? Do you have employees in your company whose work place productivity, judgement, decision making, emotional stability, days off work and safety are affected by their use of prescription drugs? Are your health benefit costs to provide prescription drug coverage to your employees rapidly escalating? Are you a disability, life or automobile insurance company experiencing increasing claims resulting from the usage of tranquillizers, sleeping pills and anti depressants? Are you a prescriber of these drugs, a healthcare professional, counsellor, helping someone withdraw from their accidental or involuntary addiction or an educator in prescription drug addiction? Are you aware that a recent US study revealed that fewer than 30% of prescribing doctors know how to diagnose addiction to prescription drugs? 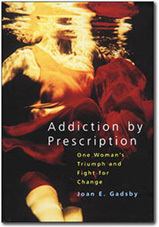 Are you aware that anti-depressants (link to list and facts) (the follow up to Valium 25 years later) also have potentially serious side effects including drug-induced mania leading to suicide, suicidal ideation, violence, criminal acts, disinhibition, drug induced severe anxiety, agitation and depression, drug-induced obsessions and compulsions, drug-induced akathisia, tolerance, addiction and withdrawal etc.? 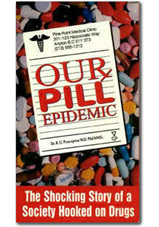 Are you aware that documented evidence shows that anti-depressants including Prozac, Paxil, Zoloft, Luvox and other mind/mood altering drugs including tranquillizers and sleeping pills (Valuim, Xanax, Ativan etc) are involved in the alarming increase in some of the murder/suicides, suicides, domestic violence, bizarre mass killings, (parents) killing children, road and air rage, school shootings and work place violence in North America? Prescription drugs are "big business" for the multi-billion-dollar international drug companies with worldwide sales estimated at $300 billion. Central Nervous System drugs including BENZODIAZEPINES (tranquillizers and sleeping pills) and ANTI-DEPRESSANTS reached an estimated $75 billion. Drug companies spend more on marketing and promoting their drugs than on research and development  ($15 - $20,000 per doctor) and an estimated $8.3 billion in the United States in 1998. People trust their doctors "to do no harm", often do not give informed consent or become knowledgeable about the risks and benefits of drug therapy (or search out other non drug alternatives or make lifestyle changes including diet and exercise). Prescription drug addiction to tranquillizers, sleeping pills and anti-depressants affects millions worldwide, is ten times the problem of illegal drugs and is far more gripping and debilitating than addiction to heroin or cocaine. Withdrawal is recognized to be much more difficult and prolonged lasting months and years. It is the Hidden Health Epidemic affecting unsuspecting people worldwide and their families whose lives, careers, financial security, emotional stability, quality of life and health are seriously impacted by their "accidental/involuntary addiction."